One of two bulbs had burned out. Turn off electricity and pull plug from appliance. Remove 5 or six screws from the bottom panel of appliance. This allows you easy access to remove bulbs and sockets. Remove the two screws from the sockets and remove the wires clipped into the sockets. remove damaged sockets and bulbs if both need to be replaced. Insert wires onto new parts and place back into unit.Replace bottom panel and your repair is complete. Thank you for the parts and helpful instructions from you customers. Made the repair really easy. The light bulbs were burnt out and broke at the base when I tried to replace them. Then the brittle sockets broke when I tried to loose the metal bases from the now broken light bulbs. I took 5 screws out of the bottom of the microwave so I could get to the socket, took the single screw out that was holding the socket, slid the silicone sleeve wrapped electrical connectors off the broken socket and threaded them back onto the replacement sockets. Screwed the new sockets back it, replaced the bulbs, screwed the 5 screws back to hold the microwave base back up. All done! Maybe 5-7 minutes. Everything fit. Everything worked. Super Easy. 5 screws to take out and one for the socket. screw in bulb and replace socket with one screw and done...so simple, simple, simple. Replaced with 2 new bulbs. After reading all the frightful reviews re broken bulbs and broken sockets, I was fearful of having my bulbs replaced. My daughter came and she had no trouble at all until she tried to replace the cover which hung down, but later dropped out completely It wasn't easy to get it in place, but eventually it popped into the correct slots and she screwed it on with the single screw. I am so happy to have it fixed as I depend on that light when I'm cooking on the stove beneath the microwave. Ordered on Monday, received Wednesday morning. Took less than 10 minutes to replace the bulbs and sockets. The only problem is that the the micro switch is a 3-position. On, Nite Lite and Off. The replacement bulb is just On/Off. Really doesn't bother us all that much. Didn't see that we had a choice of bulbs. First I covered the top of the stove with a bath towel. Then I removed philips screw in order to lower bulb cover. Lowered bulb cover. The glass portion of the bulb separated from the threaded portion of the bulb leaving the threaded portion inside the bulb socket. I then used the largest slotted screw I have and it fit perfectly to the outer edge of the threaded portion of the bulb. Turned the slotted screw driver, the threaded portion of the bulb unscrewed from the bulb socket. Like taking candy from a baby. Screwed in the new bulb. Tested it and it works perfectly. Reinstalled the bulb cover. The whole thing took 10 minutes. The microwave instructions say to break the "seal" before removing the night light (once you've opened the compartment with a screwdriver). Since the compartment is underneath the range hood/microwave and the light bulb faces away from you, you cannot know what they are talking about till you try to unscrew the bulb which causes the glass bulb to break off from the metal part. At this point TURN OFF the power to the microwave if you haven't already done so. 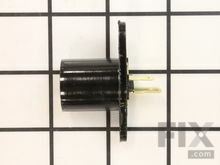 The light bulb is held in place by some hardened glue which is the "seal". How you would "break" it is unclear since you can't see it. 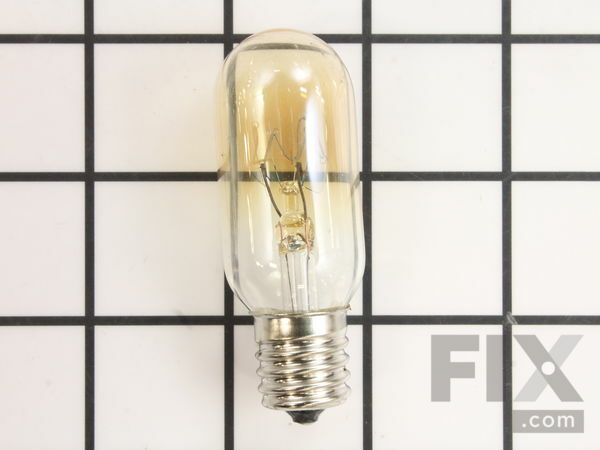 But once the glass bulb is carefully rotated enough times it will compeletly separate from the base (the filaments holding it to the base will snap). You need this to happen so that you have enough workspace to remove the base. Then it's like any light bulb base and socket problem -- you need to insert the pliers to grab hold of the metal base to carefully rotate it to unscrew it from the socket. But it is hard to get a needle nose pliers between the socket and the metal because you can't see very well and it is very much smaller than a regular light socket. I wound up inserting a toothpick between the base and socket to give myself enough space to insert the pliers and grab hold of the metal base. Then I carefully moved the base around a little at a time in the socket till it was loosened, repositioning the toothpick and pliers several times so that I was always grabbing a hold of new metal. Doing this slowly will avoid breaking the socket. Then I screwed in the new bulb and closed the compartment.